The ladies of Eighteen25 are holding their annual Halloween Spooktakular September event, and Kristyn from Lil' Luna has gone all out with this amazing Halloween Display. 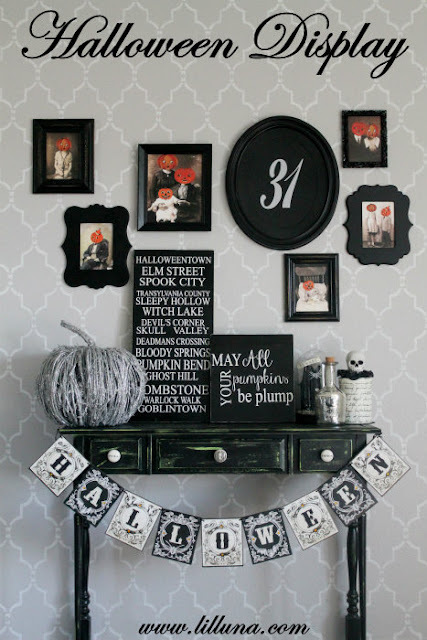 Her tutorial will show you how to make everything from the subway art and 31 plaque and she is giving you the printables for the fun framed Halloween pictures! You can check out the full display and get the printable Halloween pumpkin head photos over at Eighteen25.